After routing Rutgers Saturday, the Huskies jumped to No. 8 in the Associated Press rankings, their highest slot in that poll since late in the 2001 season. Washington’s 48-13 rout of Rutgers Saturday played favorably with voters in both major college football polls Monday. The Huskies surged in the Associated Press rankings from 14th to No. 8, and seven spots in the coaches poll, from 18th to No. 11. The AP ranking is Washington’s highest in that poll since a No. 8 placement in Week 9 of the 2001 season. The last time Washington had a better September AP ranking was Sept. 24, 2000, when the Huskies were No. 6 before dropping a 23-16 decision to Oregon. UW finished 11-1 and defeated Purdue in the Rose Bowl. Washington received 884 points in the Associated Press rankings. Alabama (1,518) remained No. 1 with Clemson (1,416) second, Florida State (1,413) third and Ohio State (1,324) fourth. Stanford (1,140) came in at No. 7. The only other Pac-12 school in the Top 25 was No. 24 Oregon (242). UCLA (62), Utah (43) and Colorado (1) also received votes, but USC fell out of the rankings. In the coaches poll, the Huskies came in behind Iowa. Among Pac-12 schools, only No. 4 Stanford is rated higher. Oregon is at No. 23. USC and UCLA fell out after losing to Alabama and Texas A&M, respectively. 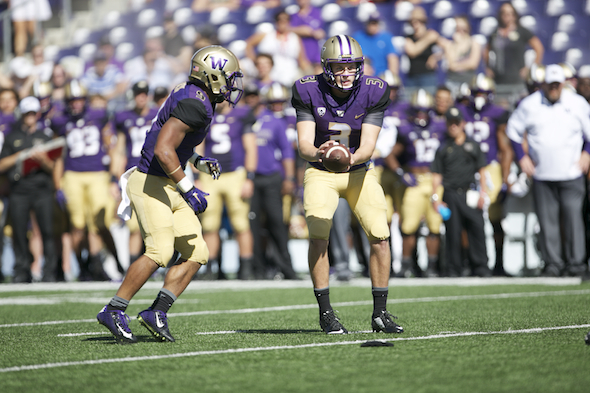 Washington will take on the University of Idaho at Husky Stadium at 2 p.m. Saturday. (Pac-12 Networks). Washington has not lost to Idaho since 1905, capturing 34 consecutive victories. UW is a five-touchdown favorite. I hadn’t remembered Oregon had kept us from a perfect season in 2000 – Now I HATE them even more! Speaking of the much-reviled PAC12 Networks, any idea why Comcast is only giving me one of the channels now (431) and not the UW-Rutgers replays on 430? Seems like last year it was the other way around.